Blog: "Squeal Like A Piggy!" Has your blog site been taken over by a malovent bug? It keeps flipping over to an advert to some 2d Amendement advertiser. It will do this 3 or 4 times in a row. Very annoying. re-intalling the old version Real Soon Now. encountered the same problem in IE, which is related to the "RING" network to which I have subscribed for some 3 years. Recently, I've experienced the same problem, even in the old Firefox. The solution is to use the back-button, which will take you back to the Geek Screen you started on. I've not seen it re-occur after that. I agree, this is a bug and a particularly obnioxious one, at that. My plan is to contact the ring-net sponsor and complain. Then to discontinue my membership, "anyway". It was originally intended to provide readers with a simple way to view other 2nd-amendment and shooting-oriented websites even though I had not included the link in my sidebar. It is no longer serving the original purpose because, as you have described, it takes you to a new webpage whether you wish or not. Just between you and me, I think it's a Liberal conspiracy. My apologies to readers who have encountered the same problem, and have not reported it. As I said, I have noticed that, but I discounted the phenomena as a Firefox problem, and ignored it. Now that I know it's not something that only I have noted, I can take steps to resolve the problem. And if YOU see any other problems with the blog, I encourage you to let me know so I can take steps to resolve the issue(s). In this video, a drunk steals a tank and goes on a "walk-about" through San Diego. 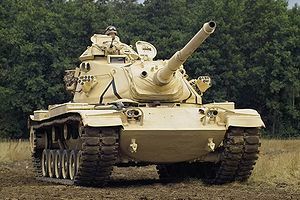 This is what tanks look like, and this is just a minor perspective on what tanks can do. They're big, they're loud, they're powerful, they're scary (on both sides of the armor plate). They're a rolling pill-box. A man with a gun has NO defense against them. On the other hand, they're fragile; they're so complicated to operate that one would find their operation is not intuitively obvious. Segue, Vietnam, September 1969 - September 1970. You are there. Or at least, I am. I do remember working with a Tank Squadron (3/4 11th ACR ... Armored Calvary Regiment) while I was serving as an infantry Platoon Sgt with the 1st ID. Later, about halfway through my tour, the 1ID returned to the U.S. Since I had only half my tour completed, I was reassigned to the 25th Infantry Division ("Tropical Lightening"). The 25ID didn't know what to do with me. Since I was an E6 (Staff Sgt) they decided to try me in the only open slot available to my rank; tank commander. I had ridden on tanks and worked with tankers for much of the tour so far, but I had no idea how to use a tank except as support to Infantry operations. I lasted one day as a tank commander. "Here is your helmet. It's connected by the radio on squadron frequency, and by intercom. Push forward on the helmet-control to talk on the intercom, push backward to talk on the radio." Or was it the other way around. I never could remember. "As the Tank Commander, you will ride in the turret. Oh, and this grip-lever in the TC position? It fires the Main Gun. Whatever you do, don't touch it!" We drove around for a half-day with the rest of the squadron, and then the Squadron Commander decided (I assume) to see how well I functioned as a TC. Either that, or he was just bored and wanted to have some fun. I received a call to fire on the woodline to the right, which was suspected of harboring VC ... or so he said. Not being entirely stupid, I had the driver stop, and face right. Being just stupid enough not to ask the obvious questions (How do you aim the gun from the TC Cupola? ), I just ... lowered the gun to what I thought might possibly be the appropriate elevation, ensured by sight that the gun was pointing in the general direction of the woodline, and touched it off. You have never lived until you have been entirely certain that you have the equivalent of the Biggest Gun in the Hood! Unfortunately, I was aimed just a little bit high. The target was about 200 yards away. I absolutely devastated the very tops of the trees. The Squadron Commander said: "Nice job, you killed a bunch of trees. No VC in there". I replied: "I'm Infantry. Beg to report, no snipers remain in those trees!" On the other hand, I probably pushed the push-to-talk switch the wrong way, so I'm not sure if the Squadron commander heard my smart-mouth reply, but I'm pretty sure my "crew" did. Fortunately, later in the day my tank was down-graded for a bad road-wheel. We went back to the camp and we started to replace the road-wheel, which was estimated to take 3-4 days. I am sure the road wheel was bad. I'm pretty sure the Squadron Commander didn't just decide his squadron was safer without Sgt. Geek commanding one of his tanks. Since I know nothing about tanks, and I am not mechanically inclined, I made a deal with the crew. They would do the work, and I would stand permanent watch. Which means that I slept in the day (for the next 3 days), and they sleep at night while I stood their watch on the Berm in the Night Defensive Position (NDP). When the tank was repaired, I was reassigned. They got a bunch of other infantry guys from 1ID-to-25ID transfer, and they had us assigned as "ride-alongs". When the tanks would Lager Up, my squad of infantry "attached" would go out and set up booby-traps on the likely avenues of approach. I liked booby traps, but they didn't have sufficient materials (a plastic spoon and a clothes-pin, if it matters) to build the Good Kind of initiators. So I had to use the "two pieces of copper wire with a slip-joint", which was the Not So Good Kind of initiators. The idea was, when someone walking down the trail hit the tripwire, it pulled the bare-wire loop of one wire (the wires were insulated; the loops were bare) to the bare-wire loop of the other wire. The insulated part of the wires were inserted through the bare-wire loops of each wire, and it was a loose slip-joint which was VERY easy to slide together. When the bare-wire loops came in contact the circuit was complete and the Claymore mines blew the heck up .. big-time! It's not worth the effort to illustrate, and I know it's not intrinsically obvious. Just assume that the Good Kind was fairly fool-proof and required a POSITIVE pull on the trip-wire; the Not-So-Good Kind was very fragile, and subject to the effects of wind and gravity. Far from my first choice, but one must when the Devil drives. On the 3rd night I set up a two-claymore mine trap on a major trail, and hid the initiator in the bushes. An hour after I set it up, the wind came up and started blowing the bushes around ... which touched off the initiator. "Sorry, guys. Too dark to set up another booby trap. We'll just go 100% alert for tonite okay? Go ahead and sack out on your usual watch rota, we'll just set up an ambush along the trail. If you hear firing in the night, check in with me before you start shooting main guns along the trail, please." We got through that night without any problems (eg: no attacks), and the next day they assigned me as Labor NCO to the 25th Infantry Division Headquarters at Cu Chi. I spent the rest of my tour as "Labor NCO" in the 25ID HQ company hiring Vietmese girls to clean hooches for officers and NCO's in the company, and never went into the field again. Which is a whole other story. I never knew for sure what model tank we were working with, but for 40 years I've been curious. 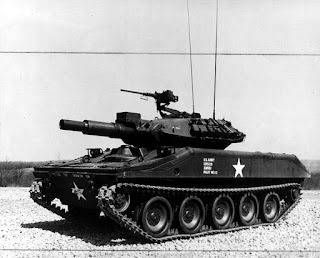 I thought they were Sheridans, but that would have made them the M551 Sheridan .. but the gun is too stubby, it's now that I remember. I thought they were M60's, would have made them the M60 variant of the Patton tank. Looks right, gun is right. But only a few of them were assigned in Vietnam. Yes, some to the 11ACR (Eleventh Armored Regiment, "Blackhorse"), but I gather only in 1/1 11ACR, which was outside our area. We worked with the 3/4 11ACR. 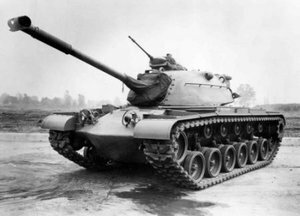 Understanding that this all happened over 40 years ago, I'm just wondering if there is a reader who can definitively state what version of tank we may have been using, at that place, at that time. Anyone? Show of hands, please? Now, THAT'S a State of the Union message. Why haven't we heard this ... or something like this ..... lately"
Again, this link thanks to an article by David Codrea on "The War On Guns". I'm not The Only One talking about Jury Nullification. A 78 year old man in New Jersey (where else?) is on trial for his attempts to pass out pamphlets on the concept in front of a courthouse. The judge contends he's trying to sway juries. The Defendant says he's just trying to education The People, and was only "... hoping that jurors are among them."